A Lost Boy of Sudan finds refuge caring for injured children | Norton Children's Louisville, Ky.
Abraham Aluel greeted 5-year-old Hunter with a smile. The young boy, there to get an X-ray of his leg, extended his hand. Abraham took it. There was an instant bond between the two as they strolled off to the X-ray room at Norton Children’s Orthopedics of Louisville. 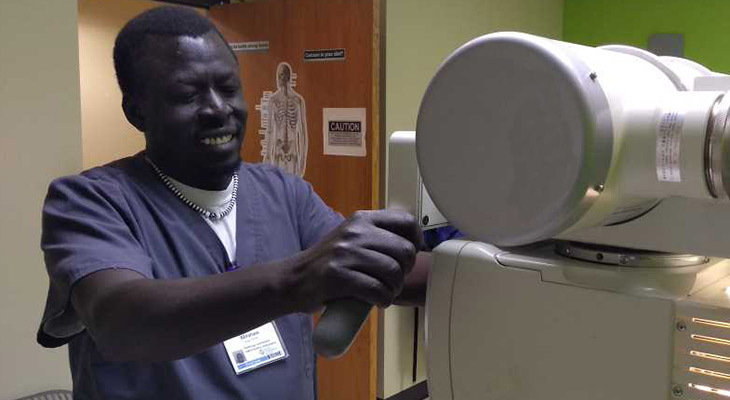 It’s been quite a journey for Abraham, a radiology coordinator, to get to this point. Abraham is known as one of the Lost Boys of Sudan. At just 9 years old, he was one of 20,000 boys who fled their homes in the 1980s to escape a genocidal civil war. More than half died during their thousand-mile journey on foot to neighboring Ethiopia. They spent the next decade living in mud huts with no electricity or running water. Many survived by sucking the water out of mud. “It was horrible, but you had no choice,” Abraham said. Their first chance at freedom arrived in 2001 when several thousand refugees came to the U.S. Abraham was among the hundred or so who found a home in Louisville. All he owned was what he had on his back. In 2003, Abraham started working in the environmental services department at Norton Healthcare before moving into a position in sterile processing. He also enrolled in school to become a radiology technologist — tuition paid by Norton Healthcare. After graduating, Abraham started working at Norton Children’s Orthopedics of Louisville. His specialty — aside from taking X-rays — is lightening the mood with a little humor. He also found a passion for helping others. Abraham loves his patients, and they love him back. In fact, he was named a recipient of the 2019 “Commitment to Compassion” award, sponsored by the Partnership for a Compassionate Louisville. The award, given to only a handful of health care professionals each year, recognizes those who improve the lives of those around them, and inspire and challenge others to be compassionate in all they do. We offer specialized care for growing bones. “What he’s gone through to get where he is today is pretty amazing,” said Sarah DuPlessis Young, physician assistant with Norton Children’s Orthopedics of Louisville. Despite being thousands of miles away, Abraham hasn’t forgotten about Sudan. It’s still dangerous there, but he’s returned every year since 2007. “That was the first time I saw my mom in 20 years,” Abraham said of the 2007 visit. At night, he works extra so he can send money back home to his family. He also hopes to build a school in his former village.